AIM celebrated the ribbon cutting for Good Hope Community Center, the last of four community centers in historically African American neighborhoods in Montgomery County. Montgomery County has a rich history of neighborhoods where people live on land their ancestors bought when they were freed from slavery. For most of this history, the neighborhoods were overlooked and neglected. Starting in the 1990’s, neighborhood leaders could not get even basic repairs in the community centers in Historic African-American neighborhoods, while beautiful new centers were being built in other parts of the county. These centers played a unique role as gathering places for communities that had dispersed over time. Flooding, windows that would not open, burnt out light bulbs that were never replaced, and concrete floors that hurt the joints of seniors in exercise classes were all common. Starting in 2005, leaders gathered together as part of Action In Montgomery, and realized this was happening not just in their individual neighborhood center, but across the county. AIM brought together its broader network of congregations to support the issue. In 2006 County Council and County Executive Candidates promised AIM leaders they would include $29 Million in funding to renovate these centers in the budget, but by early 2007 that promise looked like it might end up being like all of the previous promises to these communities—empty. To move the issue, AIM held a series of actions at the centers, inviting councilmembers to see for themselves the terrible disrepair that had been allowed to fester, culminating in an action in April 2007 with over 1000 Montgomery County citizens—white, black, and Latino. African-American leaders taught the history of segregation in Montgomery County from their own personal experiences. This included African-American students not being offered 12th grade education, denying them a high school degree and students having to pay to ride the bus for dozens of miles to attend the only high school for African-Americans until 1958. At the action AIM secured the commitments of a majority of the Council to support full funding for the centers’ renovation. The ribbon cutting at Good Hope marks the end of the rebuilding and renovating of these four centers. Links to all four of the recreation centers. Mayor Fulup & Rev. Dr. Alonzo Perry Sr. In January, Jersey City Mayor Steven Fulop sent a letter to Honeywell to demand an increase in affordability on a 95-acre site from 5% to 50%. This comes after Jersey City Together spoke to thousands of people across Jersey City and secured commitments from the majority of the city council in support of this change. The Interfaith Community Organization, a previous IAF affiliate, successfully sued Honeywell to force remediation of chromium contamination on the site decades ago. Article in the Jersey Journal here. Rev. Laurie Wurm, a former leader with Interfaith Community Organization, and the city council candidates just before the election. At Boston Planning & Development Agency meeting, more than 80 GBIO leaders show support to Boston Properties for making $6 million deal for preservation and affordable housing. When Boston Properties announced plans for a new $1 billion development, Old South Church and Trinity Church – both members of the Greater Boston Interfaith Organization – opposed the project, citing the Massachusetts Historic Commission’s ruling that new shadows from the high-rise could damage their historic buildings. After leveraging these concerns in negotiations with the developer, the two churches have won $6 million from Boston Properties -- $3 million for the two churches for historic preservation, and another $3 million for a citywide fund for affordable homeownership programs. GBIO plans to keep pushing for more homeownership funding from big developments. Sounding the Call for "We the People"
On Sunday night, nearly 1,600 Metro IAF Virginians from 58 VOICE congregations and schools throughout northern Virginia secured commitments from Virginia Gubernatorial Candidates Mr. Ed Gillespie (R) and Lieutenant Governor Ralph Northam (D) to raise Virginia's felony larceny level, increase support for public schools and the Housing Trust Fund, fix Washington's crumbling public transit, support DREAMers and convene law enforcement and educators to end hate crimes and bullying. Leaders and Clergy from all different faiths and ethnicities packed a Prince William County high school auditorium and reignited the call for "We the People," a building of the citizen power required to demand action on its statewide Election Agenda, to forge alliances across the political and economic spectrum to move on these issues, and to compromise where necessary to create change. Gubernatorial Candidates Gillespie and Northam committed, if elected, to meet with VOICE at least twice a year, including before the state budget is formulated. Both candidates also pledged to attend listening sessions to hear issues faced by WMATA metro workers, teachers, DREAMers and others in the community. VOICE will have 400+ volunteer leaders on the ground doing non-partisan Get out The Vote (GOTV) work in four low-voting districts in Fairfax and Prince William Counties between now and Election Day to increase voter turnout by 5-10% in targeted precincts. All eyes are on Virginia. As a bellwether state, the outcome of this election will be pivotal for what is to come nationwide. 1). Zero tolerance for discrimination, hate and bullying; 2). Strengthen reporting and increase training; 3). Implement the best of the 2018 recommendations from Governor's Commission on Diversity, Equity, and Inclusion. 1). Increase the felony larceny level from $200 to at least $1,500 and change misdemeanor law for 1/2 ounce of marijuana; 2). Dismantle school to prison pipeline and invest in young people. 1). Tackle achievement gap by creating a pilot specialized grant program for Title 1 schools; 2). Address teacher shortage crisis; 3). Increase access to Pre-K for low-income 4-year-olds. 1). Ensure our Washington Metropolitan Area Transit is an affordable, reliable, and equitable transit system; 2). Uphold Metro's middle-class jobs. We need more good jobs in our region, not fewer. 1). Support building affordable housing on publicly owned land (local, state, and federal) and increase the VA Housing Trust Fund from the current two-year $8 million allocation. 1). Support keeping families together! There are 74,000 kids who are US citizens in VA that have a parent who is undocumented; 2). Support DREAMers by convening Virginia US Delegates, Senators, VA CEO's who employ DREAMers, NOVA Superintendents, Educators, VA denominational leaders & DREAMers to hear first-hand why DACA is critical. Metro IAF affiliate, Interfaith Community Organization, on stage behind him. 1,130+ leaders gathered for Jersey City Together's Fall action on Monday, October 2nd to discuss the future of Jersey City and - in particular - how 200 acres of vacant & underdeveloped land could be used to address the city's need for affordable housing and jobs. Interfaith Community Organization (ICO), a previous IAF affiliate, had forced Honeywell & PPG to spend $1 billion cleaning up hexavalent chromium contamination. Now that these sites are clean, the work begins to ensure the sites are used for the benefit of the City. Both mayoral candidates committed to work with the organization if elected, and Mayor Steven Fulop agreed "100%" with Jersey City Together's vision for the sites and committed to "work hand in hand" with the organization to rewrite at least one of the two redevelopment plans for the sites to include more affordable housing and jobs. Jersey City Together will continue the fight to turn these commitments into action. Press coverage can be found here, here, here, and here. Jersey City Together leaders discuss the future of 200 acres of vacant land. Thursday evening, May 25th, 300 leaders from United Power for Action and Justice and its southwest side affiliate, the Southwest Organizing Project (SWOP) celebrated the completion of the first phase of an effort to rebuild the southwest side of Chicago and the start of the second phase. After several years, during which one-hundred units have been renovated, the organization has seen striking results. Crime is down 50%. The two local schools in the immediate area, Morrill and Fairfield, have improved their performance -- rising from low Level 3 CPS rankings to Level 2 and Level 2+. The school just south of the area, Marquette, has gone from Level 3 to Level 1+. Local private contractors have followed United Power’s lead and bought and renovated other buildings in the area. On May 25th, to kick-off the second phase of the effort, the first $1 million commitment was announced by LISC Chicago. The expansion effort will seek to raise a total of $10 million to extend east and south of its initial target area to include 70 blocks. 1,500 people packed into Bedford Central Presbyterian Church to celebrate a year of hard-fought victories for Brooklyn communities, reaffirming commitments to one another as members of EBC, and reconfirming relationships with the commissioners of the DOT, the Parks Department, Sanitation, and the commanding officer for all Brooklyn police precincts. Some of those victories include making 13 intersections safer for pedestrians, cleaning up 9 corners and city blocks, and building better and deeper relationships with police in three precincts. Over the last year, EBC has sold 81 Nehemiah homes and has recently won the right to develop 33 new affordable apartments in Ocean Hill. EBC is also setting in motion an ambitious plan for turning underutilized property and vacant lots in East Brooklyn into tens of thousands of units of affordable housing for seniors in order to both provide them safe, comfortable, and affordable homes, as well as opening up space in NYCHA housing for younger families. EBC is also kicking off the research phase of a campaign to address the issues of mass-incarceration and mis-incarceration that are impacting the city. 101 leaders from 8 institutions from East Brooklyn Congregations in New York descended on the Brooklyn Sanitation North headquarters in East Williamsburg to clean up the trash and get rid of the disrespect. When leaders from EBC visited the headquarters last month on April 2nd, they were tossed out of the lobby. But on May 1st, the action was different. At the sanitation office, EBC demanded and received a public commitment to meet with Chief Steven Costas, Director of the Bureau of Cleaning and Collection on Thursday, May 25th. “It’s very basic that you should have clean streets, but we don’t,” said Bed-Stuy resident Sabrina Perry. Read the Op-Ed from Revs. Lacey, Miller, Jenkins, Neil and Brawley HERE. Have you heard about the Community Purchasing Alliance? As a Metro IAF affiliate, CPA Co-op is quite literally building power in their work to solarize the DC charter community. Read more about the 7 schools that are already on board by clicking on the press release here. To learn more about what we at CPA have accomplished over the past year, please check out our Annual Report. A two-year battle for improved parks in Bushwick is finally starting to pay off. 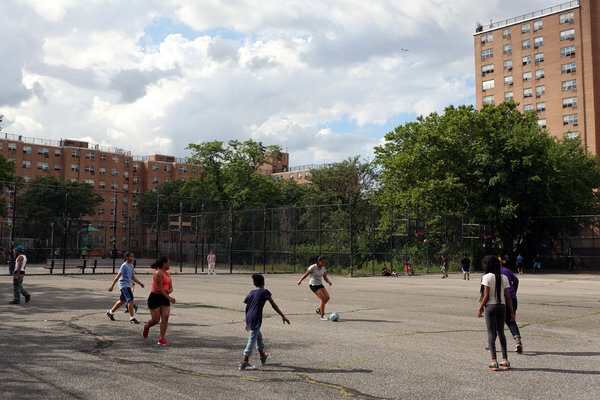 Several improvement projects are on the way thanks to residents from the East Brooklyn Congregation, a group of churches and nonprofit organizations, who have been rallying local leaders for better playgrounds. Washington Interfaith Network wins $550 million investment in DC neighborhoods. WIN created a $450 million Community Benefits Fund and a $100 Neighborhood Investment Fund to ensure that the investment in downtown development is matched by an equivalent investment in DC’s neighborhoods. Revenue from the funds is dedicated to affordable housing, neighborhood retail, libraries, other public facilities, infrastructure repairs and upgrades in the city’s poorest neighborhoods, including the The new Washington Highlands Library. In response to Mayor Stephanie Rawlings-Blake’s proposal to close half of the recreation centers, BUILD led the fight at City Hall to keep them open. After turning out hundreds of youth, parents, and residents throughout the City budget hearings, BUILD joined the Mayor and City Council members to support passing a 2 cent bottle tax to fund the recreation centers and keep them open. Regina Hammond and her husband Keith live in Johnston Square, an area of east Baltimore with high rates of poverty and crime but also many areas of stable homes. In July of 2013 Regina attended her first community association meeting. “Children everywhere in the street. Loud knocks on the door and no one there. I went to that first community meeting because I wanted the kids to have something to do other than run in the street. I wanted my home to be peaceful at night and in the summers.” She left before the end of the meeting in frustration that her concerns were not going to be addressed. Serendipitously, BUILD organizer Terrell Williams was present and followed her out. That brief interaction led to a series of relational meetings and leadership development including 3-day training. Regina gathered three other people and Mt Sinai Baptist Church in the neighborhood to form a core team ready to work for change. The first action was to hold a cleanup in greenspace overgrown with weeds and long neglected by the City. Church youth and adult volunteers and a dozen members of a nearby veterans’ association began the long process of cutting down the weeds and picking up the trash. They kept up the work and expanded to four quadrants of Johnston Square. By 2014, word had gotten around that the person to call was Regina if anyone wanted to create change in Johnston Square. Regina and other neighbors now lead ReBUILD Johnston Square, a community association that receives funding from various foundations and corporate grants. Regina has characteristics of a leader and sets an example for how organizing power and organizing money can transform lives and communities. On September 10th over 80 Justice United leaders met at Lattisville Grove Missionary Baptist Church in rural Hurdle Mills, NC to prioritize top community concerns for action that were surfaced by the organization's recent listening campaign. Leaders voted to focus on broad categories of concerns related to Housing, Immigration, and Jobs, and affirmed Lattisville Grove Pastor George Crews III’s vision of a truly broad based organization: one capable of making change across the urban / rural divide; where leaders of all races could learn how to build reciprocal, relational power to resolve issues rooted in historic injustice. After a Feb 2nd action of over 900 people, the Greater Boston Interfaith Organization has been in the news around Criminal Justice, Affordable Housing and Health Care. “This is the time, We are a close as we’ve ever been.” Massachusetts Senate President Rosenberg said this after committing to pushing through GBIO’s platform on Criminal Justice Reform, which includes pretrial bail reform, the elimination of mandatory minimum sentences for nonviolent drug offenders, the elimination of excessive fees and fines and the elimination of excessive use of solitary confinement. In Healthcare, GBIO and more than two dozen additional group groups representing Massachusetts hospitals, nonprofits, labor unions, and other organizations are urging Governor Charlie Baker to oppose any federal policy changes that couldthreaten Medicaid coverage for thousands of poor and disabled people across the state, as well as the viability of the state’s subsidized health care insurance through the exchange. East Brooklyn Congregation winning battle for Bushwick playground improvements: A two-year battle for improved parks in Bushwick is finally starting to pay off. Several improvement projects are on the way thanks to residents from the East Brooklyn Congregation, a group of churches and nonprofit organizations, who have been rallying local leaders for better playgrounds. Residents have spent two years lobbying for better park conditions for kids. As our region continues to recover from the devastation of superstorm Sandy, Gov. Cuomo and Mayor Bloomberg have rightly said that the city and state need to update their infrastructure to deal with the increased likelihood of future flooding. Bloomberg even based his endorsement in the presidential race on President Obama’s position on climate change.